Alan Greenspan confessed to the gold price suppression scheme while he was chairman of the Federal Reserve. He gave his famous testimony to Congress on July 24, 1998: "Central banks stand ready to lease gold in increasing quantities should the price rise." The Reserve Bank of Australia confessed to the gold price suppression scheme in its annual report for 2003. "Foreign currency reserve assets and gold," the RBA's report said, "are held primarily to support intervention in the foreign exchange market. In investing these assets, priority is therefore given to liquidity and security, in order to ensure that the assets are always available for their intended policy purposes." And now the Bank for International Settlements, the central bank of the central banks, has confessed to the gold price suppression scheme. The confession of the BIS came last June in a fairly candid speech by the head of the bank's monetary and economic department, William R. White, to central bankers and academics gathered at the BIS' fourth annual conference, held in Basel, Switzerland. The speech was provided to GATA this week. "The intermediate objectives of central bank cooperation are more varied. "First, better joint decisions, in the relatively rare circumstances where such coordinated action is called for. "Second, a clear understanding of the policy issues as they affect central banks. Hopefully this would reflect common beliefs, but even a clear understanding of differences of views can sometimes be useful. "Third, the development of robust and effective networks of contacts. "Fourth, the efficient international dissemination of both ideas and information that can improve national policy making. "And last, the provision of international credits and joint efforts to influence asset prices (especially gold and foreign exchange) in circumstances where this might be thought useful." That is, central banks collaborate -- and since they do so in secret, it may be said that they conspire -- to rig the gold and currency markets. To use White's word, the central banks collaborate "especially" to rig the gold and currency markets. Thankfully White did not accuse those who read his speech of being "conspiracy nuts." We still have Dennis Gartman, Tim Wood, and a few others for that, even if their band is rapidly diminishing. White's speech confessing to the gold price suppression scheme on behalf of the BIS is appended. You can find the entire proceedings of the BIS conference at the Internet link included in the speech. It looks like the bankers had a much nicer time of it than the people who try to make their living wresting real money from the earth. Let me begin this meeting by welcoming all of you, both central bankers and academics, to this conference on the “Past and Future of Central Bank Cooperation." This is the fourth in a series of annual conferences, all of which have been based on the premise that these two communities have a great deal to learn from each other. In particular, we feel that the central bankers, who are on the firing line of public policy, have some comparative advantage in identifying the issues that need analysis. The academics, in turn, have a similar advantage with respect to analytical tools, rigour, and sometimes, quite simply, the time to do the thinking required. In this spirit, participation in the conference this year does mark a further step forward. Whereas in the past we primarily invited academic economists and economic historians, this year we have extended the writ to a number of political scientists interested in political and other processes, and the development of institutions to support such processes. I am pleased about this, in part because I have felt for a long time (and I think there is evidence to back this up) that the multidisciplinary approach often leads to big breakthroughs in terms of understanding. But, more particularly, I am also pleased because it responds to a specific concern that I have had for many years here at the BIS. Namely, that, as we were trying over the years to make the BIS more relevant and useful to the global community, we were relying too much on the views of economists, like myself, with no real training in such organisational matters. As I mentioned to Ethan Kapstein a number of years ago, I thought we needed help and this conference might be the first step down that path. As to the choice of the particular topic for this conference, it was in a way a “no-brainer” given that this year marks the 75th anniversary of the founding of the BIS. 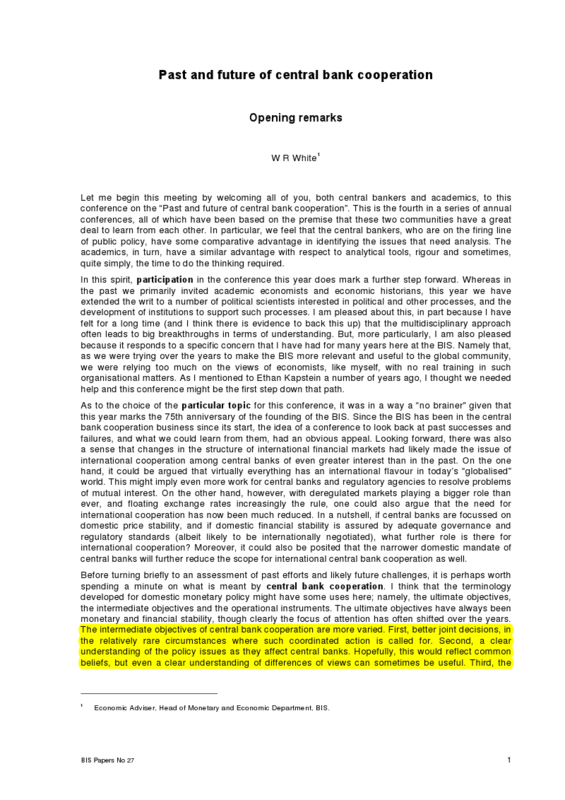 Since the BIS has been in the central bank cooperation business since its start, the idea of a conference to look back at past successes and failures, and what we could learn from them, had an obvious appeal. Looking forward, there was also a sense that changes in the structure of international financial markets had likely made the issue of international cooperation among central banks of even greater interest than in the past. On the one hand, it could be argued that virtually everything has an international flavour in today’s “globalised” world. This might imply even more work for central banks and regulatory agencies to resolve problems of mutual interest. On the other hand, however, with deregulated markets playing a bigger role than ever and floating exchange rates increasingly the rule, one could also argue that the need for international cooperation has now been much reduced. In a nutshell, if central banks are focused on domestic price stability, and if domestic financial stability is assured by adequate governance and regulatory standards (albeit likely to be internationally negotiated), what further role is there for international cooperation? Moreover, it could also be posited that the narrower domestic mandate of central banks will further reduce the scope for international central bank cooperation as well. Before turning briefly to an assessment of past efforts and likely future challenges, it is perhaps worth spending a minute on what is meant by central bank cooperation. I think that the terminology developed for domestic monetary policy might have some uses here; namely, the ultimate objectives, the intermediate objectives and the operational instruments. The ultimate objectives have always been monetary and financial stability, though clearly the focus of attention has often shifted over the years. The intermediate objectives of central bank cooperation are more varied. First, better joint decisions, in the relatively rare circumstances where such coordinated action is called for. Second, a clear understanding of the policy issues as they affect central banks. Hopefully this would reflect common beliefs, but even a clear understanding of differences of views can sometimes be useful. Third, the development of robust and effective networks of contacts. Fourth, the efficient international dissemination of both ideas and information that can improve national policymaking. And last, the provision of international credits and joint efforts to influence asset prices (especially gold and foreign exchange) in circumstances where this might be thought useful. Talking about the instruments of central bank cooperation brings us more directly to the services which the BIS has provided to the international central banking community over the years. First, I would note the various meetings of central bankers and regulators which take place in the “Basel community,” if not necessarily in Basel. These now number over 300 a year and involve governors as well as all types of specialists (IT experts, auditors, security experts, economists, etc.) within the central banks. Second, there is research and policy analysis directed to international issues. This conference is a good example of the genre. Third, there is data and information, most notably on international bank lending, cross-border securities markets, and derivatives markets. And finally, there are the BIS banking services to central banks, which have allowed us to maintain the share of global foreign exchange reserves deposited at the BIS at around 6 percent of the global total. Managing this money gives us a particular insight into how global financial markets actually work. Well, if that is what central bank cooperation is all about, has it done any good? Since I have been in the cooperation business for over 20 years now, the last 11 at the BIS, it would be strange if I did not say yes. The fact that our partners in cooperation keep coming back, in ever-increasing numbers and asking for ever more diverse products, also points in the same direction. And by the standards of other forums for international cooperation, the efforts of central banks also look pretty good. Consider, for example, the issue of collective action clauses in international bond contracts to facilitate agreement among creditors in case of default. These were first suggested by a G-10 central bank working group in 1995 (also by Eichengreen and Portes), advocated by the G-10 deputies in 1996, endorsed by the G-10 ministers and governors in 1997, overtaken by the work of the Willard Group in 1998 and 1999, subsequently forgotten about, and ultimately introduced on a geographically widespread basis only dating from 2003, and only partially in terms of content. Clearly, international cooperation is not always an easy game to play, so even the relatively modest achievements of the central bank community must be viewed positively. And I would like to believe that the contribution of the BIS to this process -- a small staff focused on customer service and the capacity to see two sides of an argument -- has also been a useful one. Yet, for completeness, it must also be noted that central bank cooperation may not always have been used to good effect. Some have argued that the efforts made here in Basel to paper over the cracks in the Bretton Woods system served not so much to buy needed time but as a means to postpone needed and much more fundamental policy adjustments. My own personal involvement with bridge loans, directed via the BIS to many emerging-market countries in the 1980s and early 1990s, led me to conclude that some of the later ones should never have been made in the first place. Increasingly, they were show rather than substance and threatened to undermine the credibility of other, more substantial forms of liquidity support. Looking ahead, a number of policy challenges might call for more intensive international cooperation, including among central banks. The first and biggest has to do with widening external imbalances. These could catalyse an international crisis at some point, with potentially disruptive movements in both exchange rates and the prices of financial assets. At the textbook level, it is reasonably clear what all the major players should do to reduce these risks. However, it is equally clear that many of them face other constraints as well, not least political resistance to following the required course of action. In this environment, it does not seem silly to suggest that a cooperative response might be required. A second challenge for central bank cooperation will be to find ways to better integrate their cooperative efforts with those of regulators and supervisors in the pursuit of international financial stability. Central bankers are increasingly aware that injections of liquidity to support financial stability may lead to excessive increases in asset prices as well as moral hazard. Regulators are also increasingly aware that their domestic efforts also have a macroeconomic dimension. These are conceptual advances. Nevertheless, the cross-border aspects of crisis prevention and crisis management need still greater attention. In particular, how a large, complex and globally active financial firm might be wound down while keeping its vital functions intact remains a puzzle at best. And a third challenge has to do with regional central bank cooperation and how this fits into the broader framework of global cooperation. The BIS was instrumental in helping Europeans prepare themselves for monetary union. Today similar interests are being expressed in the Gulf, parts of Africa, and Central America. In Asia a framework for greater monetary cooperation seems gradually to be taking shape, underpinned by increasing trade integration. Everywhere in the emerging markets there is a keen interest in learning about central banking issues from those more experienced with liberalised economic and financial systems. To conclude, whether looking back or forward, a number of interesting questions pertaining to central bank cooperation remain unanswered. I have every confidence that the presentations and the subsequent discussions will move us a long way toward rectifying that situation. May I take this opportunity to thank all those who have prepared papers, to thank the discussants, and to encourage all members of the audience to participate actively. As I said at the beginning, we all have a lot to learn from each other. So speak up.